Let us do the dirty work! 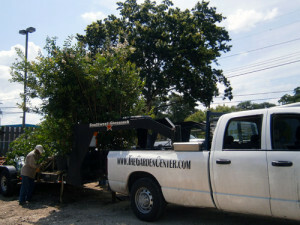 The Garden Center has a crew specifically dedicated to delivering and installing trees for our customers. Save your back and time, let our team of professional nurserymen bring their jackhammers, shovels and picks to do the job. We love this kind of stuff and can help you dig. Let's not kid ourselves, the soil in San Antonio is very rocky and often you can not dig more than 10 inches without hitting solid limestone. We have planted thousands of trees in San Antonio for over 25 years. We know what it takes and will bring the right tools for the job, every time. •Planting fees include free delivery (within our regular delivery zone), installation, mulch, and limited 1 year warranty. 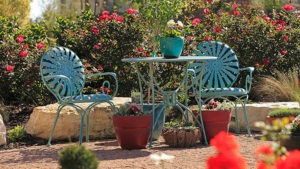 •Charge for any service of planting or delivery by The Garden Center must meet a $45 minimum. •For your convenience and safety we will submit a utility locate request for your installation site. •Tree plantings and deliveries are scheduled on a first come first served basis, Monday-Friday. Can't be there? That's okay, we can still plant it for you even if you're not home. You will receive a flag to mark where you would like your tree planted. Digging in San Antonio's rocky soil is a real hassle. Let the professionals at The Garden Center plant for you. In most cases we will be done in thirty minutes and leave you with the task of watering your beautiful new trees. Come in and schedule your planting today!